Autographed copies of "My Gentle Barn" Book are now available for purchase in our online store or on Sundays at The Gentle Barn! Click here to purchase in our online store. Founder Ellie Laks started The Gentle Barn after adopting a sick goat from a run-down petting zoo in 1999. Now, thousands of animals later (including cows, chickens, pigs, goats, horses and many more), The Gentle Barn has become an extraordinary nonprofit that brings together a volunteer staff of community members and at-risk teens to rehabilitate abandoned and/or abused animals. As Ellie teaches the volunteers to care for the animals, they learn a new language of healing that works wonders on humans as well. 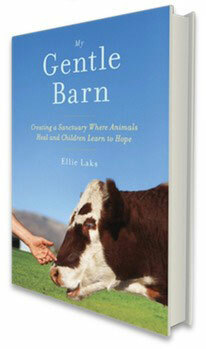 My Gentle Barn weaves together the story of how the Barn came to be what it is today with Ellie's personal journey. My Gentle Barn is a heartwarming, feel-good account that will delight animal lovers and memoir readers alike. It is a story about animal rescue, human recovery, love, life and achieving your dreams. "If your heart has ever gone out to a stray animal on the side of the road glimpsed from a passing car, read this book. This is the inspirational story of a woman who followed her heart, becoming a skilled animal listener. Ellie Laks vividly describes how she rescued countless broken domesticated animals and then learned to decipher the language of their pain. In giving voice to the voiceless and love to the unloved, Laks healed her own damaged childhood, then blazed a trail for the salvaging of the lives of other at-risk kids. In the end, Laks and The Gentle Barn raises the bar for animal rescue operations and lowers the boom on animal abusers. I loved this book." Ellie Laks has always loved animals and from the time she could walk she headed into the woods daily to be with them, sometimes bringing them home—much to her parents’ chagrin. In 1999, Ellie founded The Gentle Barn, an animal sanctuary that rescues and rehabilitates severely abused and neglected farm animals. Once the animals are healthy, they help Ellie heal at-risk inner-city and special-needs children. Ellie lives on the property outside of Los Angeles with her husband, who runs the Barn with her, and their three children. Purchase your autographed copy of Ellie's book.